Every time I conduct a memoir workshop, I encourage the group to form a memoir writing group that meets regularly. I always provide some information on how to start a group and show how easy it is to be a facilitator. Only once, did someone take the idea and fly with it. Over the years, I kept thinking that if I provided a step-by-step manual, folks might be more inclined to begin their own groups. And that is how Facilitating a Lifewriting Group is Easy was born. Publicity (including sample press releases and posters). Ideas for meeting formats that work for groups large or small. To help you begin, detailed exercises are provided for your first six meetings. Those are followed by over 60 quick and easy lifewriting ideas and 35 reproducible handouts—more than enough for a year’s worth of weekly meetings! The appendices include a bibliography, Internet resources, and sample handouts which you can use as they are or adapt for your group. In the printed version of the book, copies of all handouts are also included on an accompanying CD-ROM for you to customize for your group. 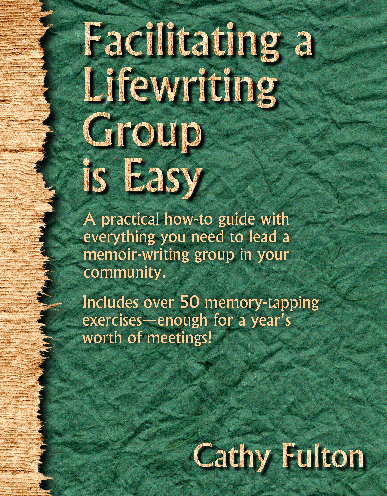 Facilitating a Lifewriting Group is Easy is available for purchase in both a hardcopy (printed) form and as an instant download (e-Book) at my Capturing Memories Store.